After debuting at no.1 last week, JRPG Persona 5 is now nowhere to be seen in the UK top 40. All signs point to Deep Silver underestimating demand, and then some. 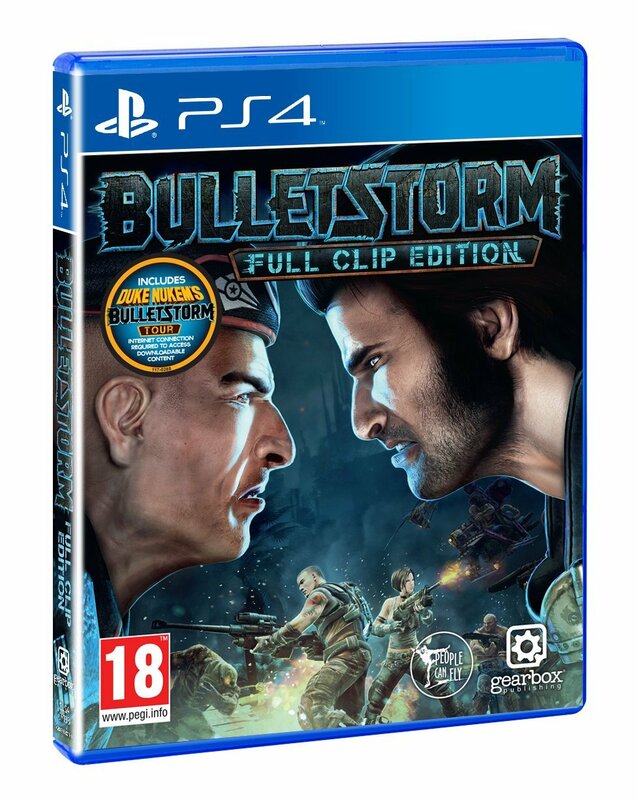 Incidentally, Bulletstorm: Full Clip Edition has also left the top 40 after just one week. We doubt this is down to stock issues though; we blame the full-price mark-up. Ubisoft’s Ghost Recon: Wildlands sneaks in to retake the top spot, making it three non-consecutive weeks for the allegedly middling open-world shooter. LEGO Worlds, GTA V, Overwatch and FIFA 17 all rise a few positions to claim the remaining respective positions in the top five, with Overwatch up from #10 to #4. Then at #6 it’s a new entry – Team 17’s exceedingly colourful platformer Yooka-Laylee. Call of Duty: Infinite Warfare is at #7, Rocket League jumps back into the top ten at #8, Zelda: Breath of the Wild falls a few positions to #9 and then at #10 it’s LEGO City Undercover. Mass Effect Andromeda leaves the top ten meanwhile, falling from #5 to #12. 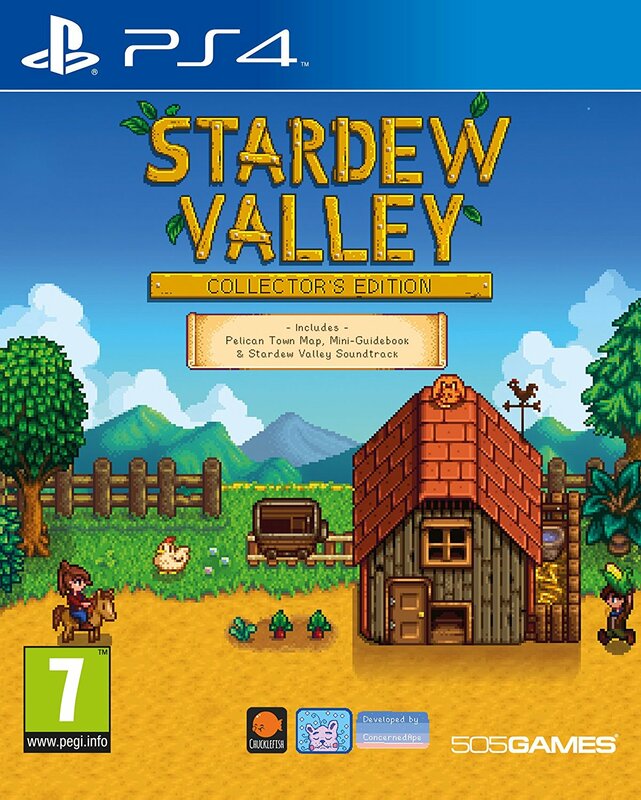 The retail release of Stardew Valley was the only other new entry in the top 40, sprouting up at #30. It’s Persona 5 that tops the UK chart this week, ending Mass Effect: Andromeda’s two week run in the process. The incredibly well-received JRPG has become the fastest-selling entry in the series, unsurprisingly, as well as Atlus’ first ever All-Formats no.1. Hurrah! We have to look back to 2013 to find the last JRPG that topped the chart: 2013’s PS3 exclusive Ni no Kuni: Wrath of the White Witch. Final Fantasy XV had the clout, but had to contend with FIFA 17 during its launch week. EA’s sci-fi opus took a bit of a beating, falling all the way to #5. Ghost Recon: Wildlands held onto #2 while the budget-priced LEGO Worlds remained at #3. Then at #4 it was GTA V, up from #5. Multi-format blockbuster LEGO City Undercover was the next highest new entry after Persona, making #8. This means Warner Bros. has two LEGO games in the top ten this week. 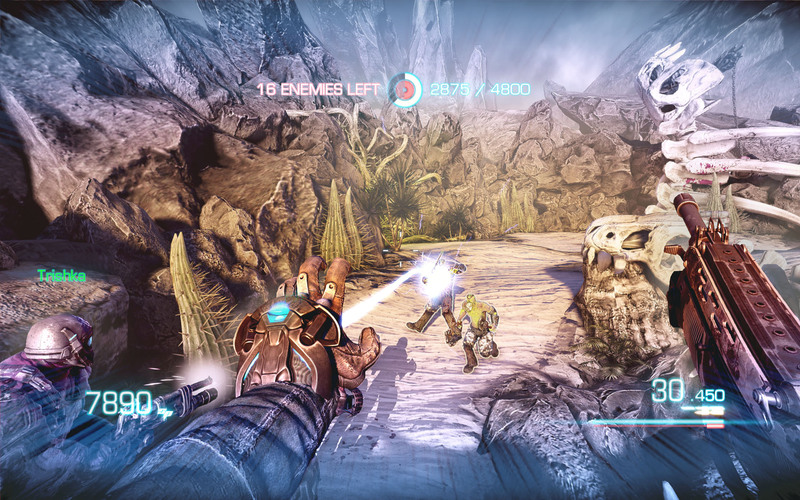 Gearbox’s re-release of Bulletstorm didn’t prove anywhere near as popular, entering at #23. It no doubt performed better on the digital services, where a discount was in place for pre-orders. The 3DS’ Yo-Kai Watch 2: Bony Spirits at #36 was the only other new arrival in the top 40, with its sister title Yo-Kai Watch 2: Fleshy Souls failing to make an appearance. These two may rise up the chart in the weeks to come though after good old word-of-mouth starts to spread. The recent announcement of Platinum Games’ involvement with Metal Gear Rising: Revengeance just goes to show how unpredictable the world of video games can be at times. If only it were a little more unpredictable then maybe would we end up with one or more of the games below, fabricated from our very own imaginations. 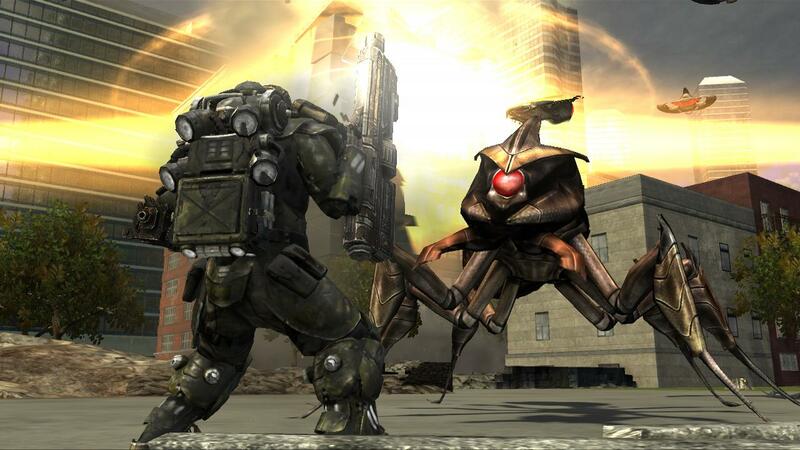 We’d like… an Earth Defence Force developed by Volition – the brains behind Red Faction (RIP). Why? While Red Faction and Earth Defence Force share the same focus on destruction, Volition’s games were backed with their own Geo Mod technology that let buildings explode in a spectacular fashion. Earth Defence Force’s buildings merely crumbled amidst some crudely drawn clouds of pixel dust. What are the chances? Slim seeing as D3 publishes the EDF series and Volition are owned by THQ. If THQ go bust and Volition are sold off, then maybe. We’d like… a Duke Nukem game developed by People Can Fly – the Bulletstorm chaps. Why? The similarities between Duke Nukem and Bulletstorm are vast. They both star a foul-mouthed lead character who’s quite happy to kick the opposition when they’re down. The weapon assortment is likewise similar, with a mix of imaginative weapons such as shrink-rays and a gun that fires rocket-propelled drills. If there was one company that we know full well could turn Duke’s fortunes around, it would be People Can Fly. What are the chances? Although the ending to Duke Nukem Forever hinted at a new Duke ‘em up, People Can Fly are reportedly working on a new Gears of War trilogy. We’d like… to see Nintendo’s take on Sonic. Why? 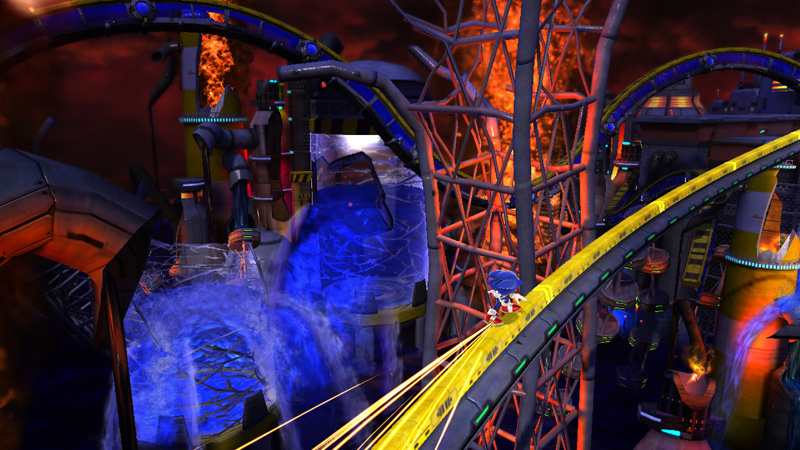 It would be interesting to see how Nintendo would handle the blue blur if tasked with making a Sonic game. Would they play it safe and go for 2D or try to apply the things they’ve learned from the Mario Galaxy series and have a stab at making a decent 3D Sonic game? Would they redraw Sonic and give him a new look? What new power-ups would Nintendo devise? The mind boggles. What are the chances? It would certainly gain a lot of press attention if Nintendo were to announce such a thing for the Wii U, and the Mario & Sonic games have proven to be very big sellers despite not quite being triple-A quality. What would be in it for Sega though? And do Nintendo really need to borrow another company’s character when Mario games shift plenty? Again, lots of questions. We’d like… Star Wars: Battlefront 3, developed by DICE and running on the Frostbite engine. Why? Battlefield 3’s multiplayer gives Call of Duty a run for its money and the large maps, use of vehicles and different character classes would apply to the Star Wars universe with ease. Seeing as the technology is already in place, DICE could probably knock it out in a year or so. EA could even call it Star Wars: Battlefield 3 if they were worried it wouldn’t sell well. We wouldn’t mind. What are the chances? EA’s future for DICE no doubt consists of Battlefield, Battlefield and more Battlefield. However, EA is very good at sharing resources with their other in-house studios and they’ve dabbled with the Star Wars license recently for the MMO Star Wars: The Old Republic. They’d have to snag the Star Wars rights from LucasArts, mind. We’d like… a fitness game disguised as an adventure game. Why? There’s a stigma attached to fitness games such as Zumba Fitness. We won’t beat about the bush here – that stigma is that these games are primarily for females. Sure, a few male-focused fitness games exist such as UFC Trainer but they’re still not every gamer’s cup of tea. We propose an adventure game controlled entirely by motion via the Kinect, split into 30 half-hour segments with a new chapter available every day. Previous chapters can be played if you’re wanting a longer workout. Along the way the main character will have to climb up mountains, fight bad guys, run away from trouble and engage other energetic pursuits that’ll require the player to run on the spot, kick and punch and jump around. Perhaps the main character could even get more toned as you play, reflecting your hard work. Doesn’t that sound more appealing than having Mel B yell “Feel the burn!” repeatedly? What are the chances? Something like this already does exist – Jillian Michael’s Fitness Adventure, which has an adventure mode set within jungle temples. It’s still not something we’d leave out on view when our friends popped over though. 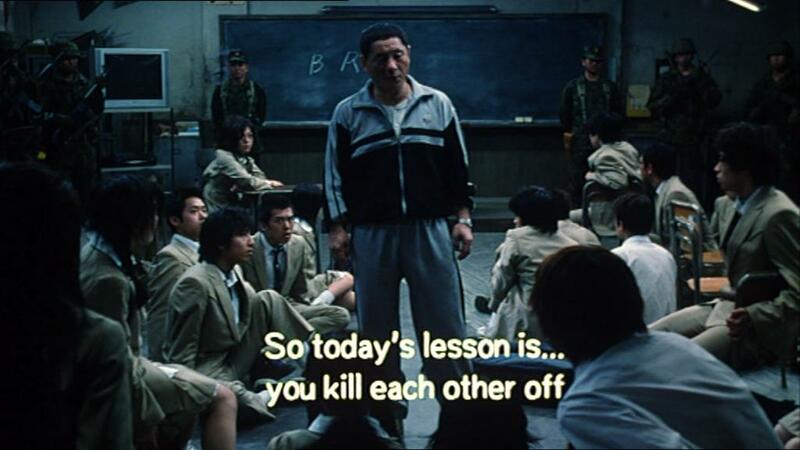 We’d like… a game based on the Asian movie extravaganza, Battle Royale. Why? Battle Royale is perfect fodder for a non-linear, open world, video game. Not seen the movie? Allow us to bring you up to speed. A coach full of Asian high-school students gets hijacked. When the students awake they find themselves on a small island where they’re told that they must kill each other to survive. The last student standing gets to go home. Each student is handed a random weapon, from crossbows to frying pans, and they’re left to decide their outcome. The rebels get stuck into killing, the girls find refuge in a light house and have what can only be called a slumber party and the nerds get busy on their laptops to try and find a way to defuse the explosive collars around their necks. Just think about the possible number of endings, which would add replay value, and how the random weapon selection would alter the way you play. Then there’s the potential boss battles against the school rebels, and having to decide who you can trust. The collars also prevent the students from staying in the same place for too long, so you’d be constantly kept on your toes. What are the chances? Stranger things have happened, and it’s not like older movies aren’t made into modern day video games. Gremlins, Jaws and Back to the Future have all hit Wii recently. Just don’t let Techland, of Dead Island fame, near it. Y’hear? A couple of weeks ago, our new release round-up carried the headline Portal Kombat – because Portal 2 and Mortal Kombat were released. Very clever, you’ll agree. Today, Chart-Track have used the same headline for this week’s chart news. Blatant thievery! Either that, or it’s quite an obvious play on words that’s probably been used in loads of places. It has: look. Sorry, you didn’t come here for South Park-referencing pun-based tomfoolery. You came here for unadulterated CHART ACTION. Well that’s going to be tricky, friend. You see, the reason Chart-Track resorted to a pun, rather than their more usual informative headline, is that there is NOTHING HAPPENING in this week’s chart. Portal 2 and Mortal Kombat retain their respective positions at the top of the chart. The only one of last week’s new releases to bother the top 40 is Virtua Tennis 4, at #23. There’s no sign of Thor: God of Thunder, even in the single-format charts; early reviews suggest that the public isn’t missing much. It has been a good week for games involving flapping about though: Just Dance 2 up five to #10, Michael Jackson: The Experience up five to #13, Kinect Sports up 14 to #17, Carnival Games: In Action up seven to #22. With the recent DS versions of Pokemon at #12 and #14, Michael Jackson is between Black and White. Loser of the week: Bulletstorm, down 14 to #38. Clearly it was not deemed an appropriate way to celebrate the royal wedding. Even with the 3DS mere days away, Nintendo fans still managed to find £30 to purchase either Pokemon White or Pokemon Black. The former sold the most out of the two, taking #1 in the chart and shoving Killzone 3 off the top. Pokemon Black goes in at #2 while EA’s Fight Night Champion punches in at #3. Killzone 3 is now at #5 while Bulletstorm drops from #2 to #4. Marvel Vs Capcom 3 leaves the top 10, dropping #7 to #14. The only other new entries in the chart are PC titles – Dawn of War II: Retribution at #17 and Rift at #19. This means THQ’s uDraw Studio misses out on the top 40, but it doesn’t do too badly in the Wii chart – it’s in at #11. EA’s Rango movie tie-in, which they’ve been rather quiet about, enters at lowly #39 too. The Xbox 360, PlayStation 3 and DS versions are nowhere to be seen. This ménage à trois between EA, Epic and People Can Fly is set on a ruined planet and features more swearing than an issue of Viz and an abattoir worth of gore. 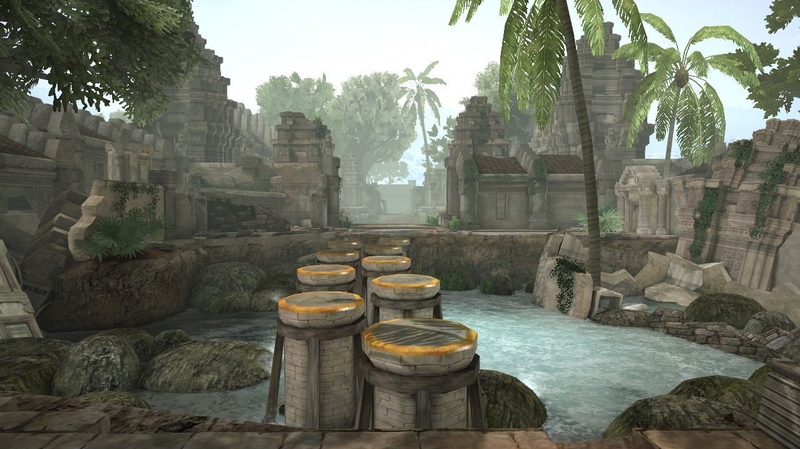 So we’re going to be looking at war-torn environments coloured with grey and brown hues, right? Wrong – the planet was intended to be a vacation resort so there are hotels, nightclubs, botanical gardens and even a theme park to trek through as space pirate Gray and his cohorts make their way to an evac point. As soon as the second chapter you’re thrust into the great outdoors, with the sun beating down constantly. Indeed, this is a game that many developers can learn from. “Kill with skill” is Bulletstorm’s moto. Equipped with an electric leash and a big old pair of boots, Gray can yank enemies back and forth and kick them into loose electrical wires, giant cacti and dozens of other hazards. In fact, there are 131 ways to kill enemies in total. A list is available from the frequently placed drop kits and soon I found myself making a mental note of which kills I still needed to perform, thus making the whole shebang instantly engaging. Each kill is rated – from as little as 10 points up to 500 – and some of the names given to these skill kills are bound to raise a smile. I personally laughed out loud making a gang member spin around on ground via the drill weapon to get the ‘breakdance’ skillshot. The more points you have the better weapons you can purchase. They’re the usual assortment of shotguns and rifles but each has been cleverly tinkered with to make them feel fresh and exciting to use. The sniper-rifle gives you control of the bullet’s direction while every weapon also has a charged shot that causes more destruction. The leash can also be used to send enemies airbourne, thus giving you more ways to cause pain. From start to finish, Bulletstorm never fails to grab your attention. Even without the skillshots it would be a brilliant game – it flows superbly with plenty of surprises and set-pieces, and as the story progresses you slowly learn how the planet came to be in ruins and how the gangs took over. You’re always accompanied by AI cohorts too who provide some often witty swear-word laden banter. You never have to watch their backs or worry about them taking all your kills – they usually take down one or two enemies and leave the rest for you. Due to having an addictive nature, it’s not impossible to imagine most gamers getting glued to their joypads and thus finishing it rather quickly. Fortunately there are extra modes that extend its replay value. Echoes features bite-sized chucks of the single player mode and ranks your score against your friend’s scores. Trying to unlock 3 stars on every level will take thoughtful planning. Then there’s Anarchy mode, a four player co-op arena battle against swarms of enemies. Here you need to work as a team as a certain amount of points are required to go onto the next stage. If some idiot is simply running and gunning, netting a mere 10 points a piece, then chances are you won’t get very far pharmacieviagra.com. There are few unique skillshots to find – like ‘Tug-o-war’, which involves ripping an enemy apart with two leashes – but I did find that luck of the draw plays a big part. Some arenas have more environmental hazards than others, see. The online lobbies appear to be ripped straight out of Gears of War 2 while much like Call of Duty, you rise up the ranks and unlock new armour and the like. Shigergu Miyamoto once suggested that adding excessive gore into a game is just a lazy way for developers to compensate for a lack of fun. I think though even the creator of Mario would enjoy playing through this one – it’s mindless violence without the mindlessness. Last week Sony said that console-exclusive titles hold back the industry; this week Killzone 3 is #1 in the chart. I’m not sure if that means they’re eating their words right now, but it’s not hard to imagine Sony being pretty chuffed that it beat Bulletstorm. EA’s slick shooter goes in at #2, with 81% of copies sold on Xbox 360. The arrival of these two big games has naturally pushed a couple of titles out of the top 10 – Test Drive Unlimited 2 takes the biggest punt going from #4 to #11. Marvel Vs Capcom 3 manages to hang in there, although it has dropped from #2 to #7. Quite a few games have made a swift decent this week – Mario Vs Donkey Kong: Mini Land Mayhem has taken a massive tumble all the way from #8 to #34 while Mario Sports Mix drops from #12 to #21. In the single formats the brilliantly titled Tactics Ogre: Let Us Cling Together takes #1 in the PSP chart and while Kirby’s Epic Yarn misses out on the top 40 it goes in at #9 in the Wii chart. Hello, *expletive deleted*. You know which *expletive deleted* game is out today, don’t you? 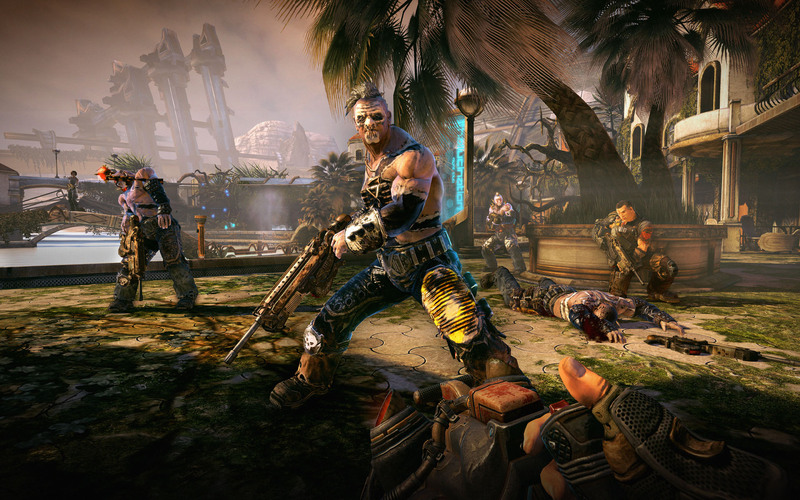 That’s right mother *expletive deleted*-ing Bulletstorm – a game best described as Gears of War meets The Club. Unlike *expletive deleted* Gears of War though, this is available for both Xbox 360 and PlayStation 3. Reviews have been mostly *expletive deleted* excellent including a *expletive deleted* 9 from Eurogamer. It has lots of *expletive deleted* swearing in it, if you haven’t guessed what we’re doing here. 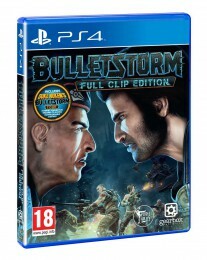 However, the release of Bulletstorm may put PlayStation 3 owners in a quandary – Killzone 3 is out this week too. Nice planning, Sony. Reviews have been inconsistent – EDGE dished out a 7 and GamesMaster magazine gave it 77% while The Official US PlayStation Magazine handed out full marks (10/10). Would they really have given it anything less though? If blood, guts and guns aren’t your thing then worry not – deBlob 2 and Kirby’s Epic Yarn are here and ready to bring an array of colours to your living room. Both are worth a purchase – deBlob 2 scored an 8 from EDGE, who are usually hard to please. The original deBlob was only on Wii and DS but this time round it’s out on Xbox 360 and PlayStation 3 too. Another high scorer is PSP RGP Tactics Ogre: Let Us Cling Together, which gained 9/10s from Game Informer, Eurogamer and GameSpot. If you’re into your tactical RPGs it’s probably best you buy it sooner than later – it’s not hard to foresee games like this becoming uber rare in the future. Gray Matter on PC and Xbox 360 looks like it could be of interest to adventure game fans – it’s a supernatural thriller from the writer behind the Gabriel Knight series. Like every other game I’ve mentioned so far, reviews have been good. Atari released retro-revamp Haunted House on Xbox Live last year and now it’s out on Wii as a budget release. Unless they’ve given it a total overhaul, I can’t say it’s one to put on your shopping list. And as much as it pains me to say it, Dreamcast Collection on Xbox 360 also sounds like a sorry state of affairs. It contains just four games (Sonic Adventure, Space Channel 5, Get Bass and Crazy Taxi) and has an RRP of thirty ruddy quid. 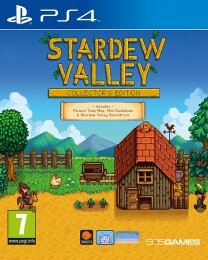 Yes, it’s a little cheaper than that on places like Amazon, but just four games? They could have at the very least put Rez on there which, like the other four games, has already been converted for Xbox Live Arcade. Grumble. Next week: Pokémon Teal/Puce, Fight Night Champion, Hyperdimension Neptunia, Serious Sam HD: 1st/2nd Encounter, Hidden Photo, PopCap Hits Vol 2, Redken Busy Scissors and THQ’s Wii accessory uDraw.